Chapter 6....how many more chapters? This is Susan Knapp from The Quilt Branch. She and Mary Jane Mattingly are the designers of the Creative Girds House Ruler 9-1/2in x 12in and authors of three books. Susan demonstrated how to get all of these angles with just one ruler. I'm a visual person so this chart did more to explain the value of this ruler than any demonstration could have. Although I enjoyed watching the demonstration, this photo says it all for me. I left out the photos I took of Susan doing the demonstration because I think this chart is more than explanatory, don't you? This quilt is on the cover of Six Halves Makes A Whole Lot More. Here's more inspiration for using one or two of those great those great roll-ups of 6 half-yard cuts. Six new projects each using 6 half-yard cuts. There are instructions for five five quilts and a set of place mats included, plus extras. 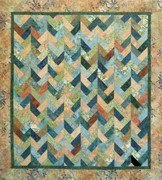 For a free pattern stop over to The Quilt Branch website!!! This is Joan Hawley of Lazy Girl Designs. Joan is a fabulous purse designer and she has a bag suited for everyone's taste and needs. I only wish I could come up with that many designs all different, interesting and functional. I'm thinking she might consider changing her business name from Lazy Girl Designs to "The Hard Working Gal Formerly Known as The Lazy Girl Designer." I love the fun print on this Margo Handbag. Just change the fabric and you have a great purse for the fall and winter too. That is what I love about carrying a handmade purse....being able to make another one in a different fabric for myself or as a gift. Joan makes 24 different Lazy Angle Blocks and uses them to make more than 230 block combinations....and she still keeps calling it Lazy. So if you are truly lazy, like me, then you can use the Lazy Angle Ruler to make your cutting so much faster and accurate....she has again done all the work for us. Hmmmm....do you think the Lazy refers to me? Us? Yikes....I can speak for myself....indeed I am lazy and I don't want or need to re-create the wheel, television, Internet or anything else....I'm so lazy there would be none of those inventions if it were left up to me!!! Don't forget about the Giveaways....don't know about them? They are posted in Chapter 3. Many of you recognize this as the Simplicity Bias Tape Maker Machine. I have one and have really enjoyed using it because I no longer burn my fingers and because I like to do things I consider boring a little more effortlessly. The Simplicity Bias Tape Maker Machine was introduced at Spring Quilt Market 2009 and since then several new tips have been added. The one you see above is the Quilt Binding Tip for 2 1/2 inch strips. I saw and touched the 1/4 inch tip that will be coming and I was very good and did not slip it into my pocket....and for the first time....I didn't even think about it...LOL. I must be recovering from my fantasy kleptomania!! Honestly it is Mimi Shimp's job to be introducing the Simplicity products....but as you can clearly see....I got so excited to be able to touch it that I stood right in front of Mimi. She is so petite that you can't even see her behind me because I'm the larger version of petite:) I'm sorry Mimi....please forgive my childlike exuberance....it happens sometimes. You may recall my previous post about the Deluxe SideWinder Bobbin Winder. Several people have commented that they want to know if it will work with their machines. The answer is YES, YES, YES....Mimi Shimp, Product Manager, has not found a bobbin yet that will not work. Long Arm Machines, Embroidery Machines and Sewing Machines....the answer is YES. Interchangeable bobbin spindles to fit all makes and models of sewing, embroidery and long arm quilting machines. Interchangeable bobbin spindles accommodate bobbins for all makes and models of sewing, embroidery and long arm machines. Winds thread from small spools to cones that hold as much as 12,000 yards. Two storage compartments in the lid to hold bobbins or spools of thread. Offers a telescoping guide that adjusts to different heights of thread spools. Enjoy a thread cutter, bobbin fill control and a speed control knob. Adjust the tension knob to accommodate a variety of thread weights. Moving right along.....this is Mimi Shimp demonstrating the Rotary Cutting Machine by Simplicity. It was also introduced at the Spring Quilt Market 2009. Simplicity later released an Extension Table that can be added to support your fabric as you move it through the machine. It also has interchangeable blades, small and large wave, that are that are available. Here you can see that I was using the Rotary Cutting Machine with the small wave blade to cut some fabric. Fall Quilt Market 2010 brought the Simplicity Deluxe Rotary Cutting/Embossing Machine. 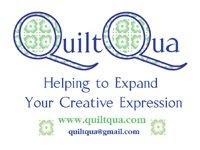 You may recall my previous post from Fall Quilt Market. And just for the record, I did politely ask Mimi if I could use the Simplicity machines because it is one thing to watch them being used and quite another to use them myself. I want to feel and see how the machines work and not necessarily have to purchase one of every machine I want to discuss here on the IHAN blog. You can see, they have also made a Deluxe Extension Table that is available. It is very helpful because it extends the bed of the Deluxe Rotary Cutting/Embossing Machine. Here you can see me moving the fabric through the machine. It is important to keep your hands both in front of the fabric and behind the fabric to keep it even as you move it through the machine. This is clearly the WRONG way to do it. You don't take your eyes off your cutting surface and you need one hand behind the fabric and one in front!!! Silly me, what was I thinking? When you don't keep your hands in front and behind the machine....you get crooked cuts and that my friends is referred to as "Operator Error." There is a learning curve to using both Rotary Cutting Machines but honestly it only took me a few minutes when I first used one (way back in 2009:). The Deluxe Rotary Cutting/Embossing Machine has many new features. First the obvious one is that it also embosses and you will see some examples of that below. Speed control that allows you to control the speed at which you would like to cut. A LED light that illuminates the cutting / embossing surface. A longer cord for the foot pedal. It cuts paper or fabric 1/4 inch to 6 inches. This what the Embossing Rolls look like up close. I did not notice the measurements on any of the packaging so I used this quarter to give you an idea of their size. Mimi was wearing the Winding Buddy around her neck and I was teasing her about her necklace. The Winding Buddies are actually use for the Bias Tape Maker Machine and the Winder Machine by Simplicity. While they are made for these machines....you might find me wearing one with licorice or a fruit roll up wound in it so I'd have easy access. Another lunatic has ambushed one of the demonstrators and commandeered their tools. I'll definitely share more about Simplicity's Deluxe Bobbin Winder but I could not resist posting this photo as a "bookmark" to hold my place as I continue to put together posts for the Open House. Remember last year when I commandeered the vacuum? It just happens....somehow that crazy Red Head just shows up and you never know what is going to happen after that. I know each of my posts are like entire magazine articles or mini movies....but once you look at the photos I ask you....which one's would you leave out? See, I obviously am not a good editor so my posts are lengthy and have a zillion photos. How else could I make you feel like you were with me? The patterns in the previous post were really fun to look at and while I was standing there admiring them I thought to myself, "wouldn't it be interesting to see just one of these patterns done in 15 different color ways." I was looking at the blue one (below) by Kathryn Schmidt from Rule Breaking Quilts. Kathryn autographed this book during Spring Quilt Market in Minneapolis. I can't think of a better time to offer it as a gift to a lucky IHAN blog reader. This is Barbara holding up one of her quilts during a Schoolhouse presentation during Spring Quilt Market in Minneapolis. Those who attended the Schoolhouse lecture received a sample package of fabrics and one very lucky IHAN blog reader will get that sample package of fabric (pictured below). The fabrics are so soft and beautifully woven. There may be enough for a small wall hanging. The next three patterns that will be given away in honor of Checker Distributors 62 Anniversary Open House....were all designed by Carolyn Griffin of Far Flung Quilts. During Spring Quilt Market, Carolyn autographed these beautiful Quilt Patterns and gave them to me. I know there will be three very happy IHAN blog readers very soon!!! Carolyn works for Checker Distributor and unfortunately the most recent photo I have of Carolyn....well.....lets just say it would not be fair of me to post it here....out of context!!! LOL When I post the most recent photos I have of Carolyn you will know why I'm not posting them here. She was very generous to offer three autographed patterns to be given away here on the IHAN blog. Amy Barickman from Indygo Junction was at Checker's Open House as well. She has been promoting her new book, Amy Barickman's Vintage Notions. Amy has autographed a fun Amy Barickman's Vintage Notions tote bag (photo below) to be given away here on the IHAN blog. The IHAN blog is also giving away two copies of Fiber & Fabric Mania! A travel Guide compliments of Checker Distributors!!! What do you have to do to win one of these 9 wonderful prizes? Just leave a comment on any of IHAN's Checker Distributor 62 Anniversary Blog Posts. That's all....other than leaving your contact information should your comment be chosen by the random number generator. One comment per post please. The prizes will be assigned randomly to the winners. Checker decorated the lunch area with the quilts below. It was not a Quilt Show so keep that in mind when you are looking a the photos. They way they were hung was for inspiration and decoration not as part of a Juried Show. Thank you Checker Distributors for hosting such a fun and educational event! "It's All About You Cupcake"